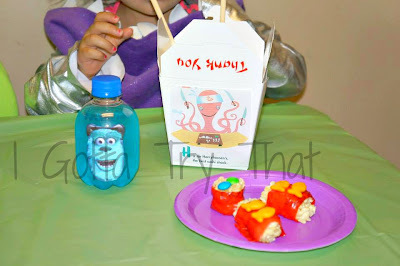 Another Disney Dinner and Movie night from my daughter. I started out with poster boards from the dollar store and had the kids decorate their own door. 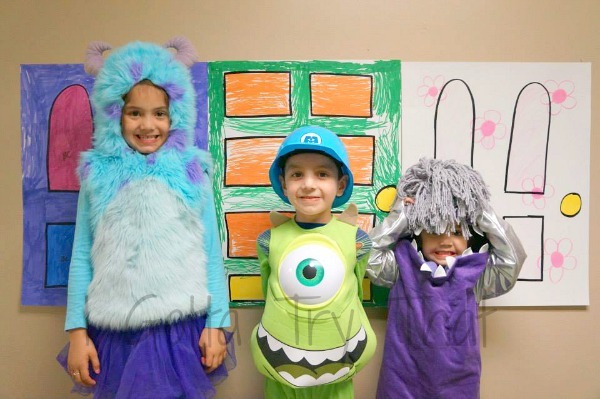 We pulled out last years Halloween costumes. You might remember the Boo costume my mom made from her other post Boo Costume. 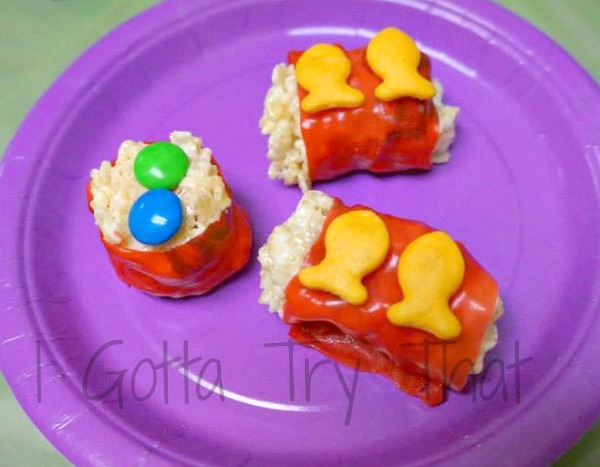 I made some rice crispies sushi treats with rice crispies, fruit roll ups, gummies, goldfish and M&M's. I asked a chinese store for some white to go take out boxes and then bought our food from Panda Express. 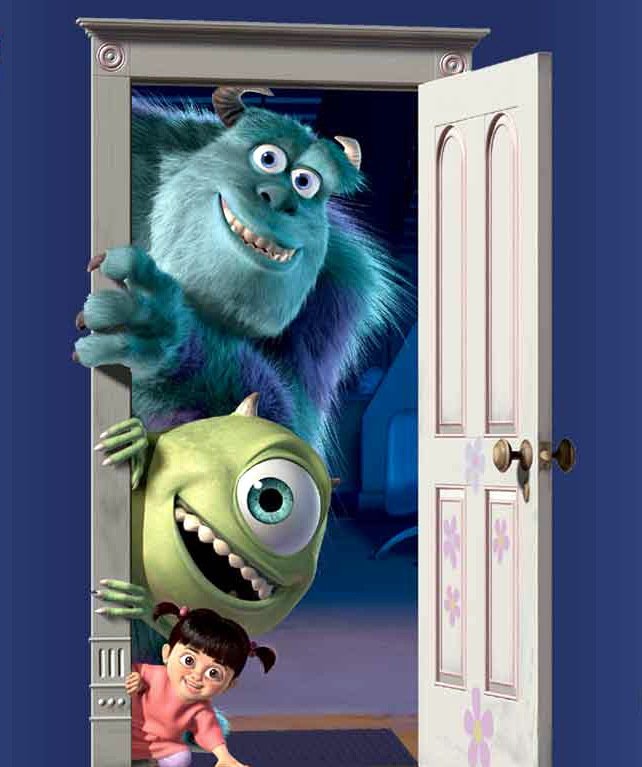 I googled Monsters Inc pics and printed out what I wanted. 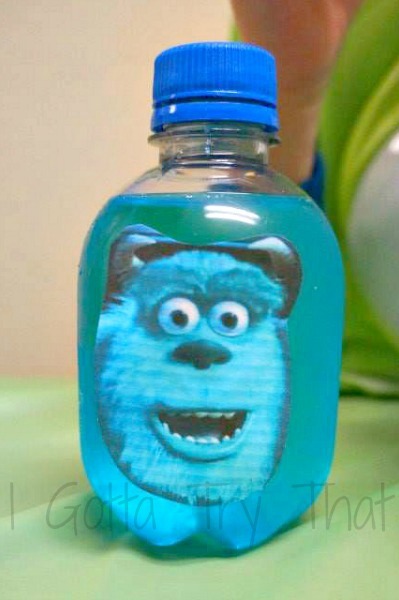 I got mini blue sodas and glued Sullys face on them. I put Harry housen on the take out boxes because thats the name of the sushi resturant. 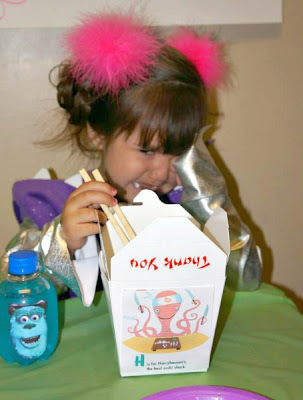 Boo was not happy that she was having chopstick problems. LOL! I went to Baskin Robins because they have this ice cream that is Monsters inc colors called Wild and Wreckless sherbet. I bought some to go and came home and glued googly eyes on clear cups to put the ice cream in. 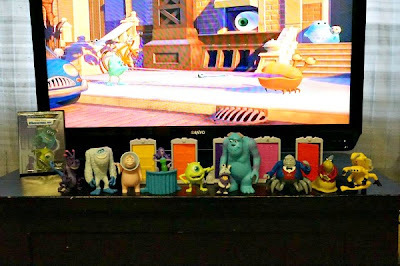 We also pulled out the monsters inc Characters we have and set them out in front of the TV. Pretty much the most adorable thing ever!!! 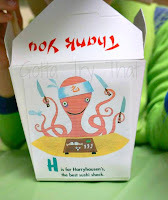 How fun, and I bet the kids loved it (with the small exception of the chopsticks, awww!!). Very nice! LOL! yes they did. Thanks for coming by and taking the time to comment! So fun!! 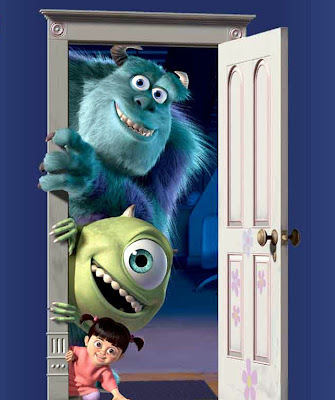 I want to come to Disney Movie night at your house!! This is amazing!! Love it!! Ha ha, thanks so much Crystal! Again totally adorable! I love it! Y'all are having so much fun! Thanks for coming by and for your comments Shelley! 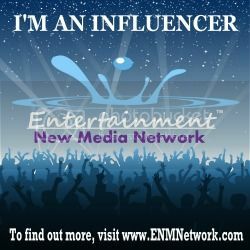 Thanks Kaila and I am headed over right now to follow back! Oh my gosh, what sweet memories you made!! Perfect! Thanks Shay and thanks for stopping by! Hi Marcie! 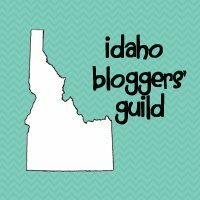 I stopped by from the blog hop! What a fun idea and your kids are adorable! I am following you via GFC, FB and G+. please follow me back. 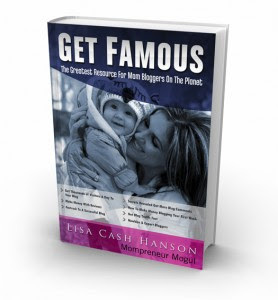 If you enjoy my blog post please leave a comment. I appreciate the support. Thanks so much! Going to follow back right now! 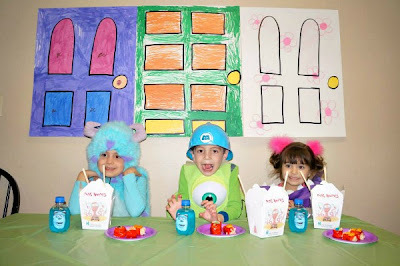 What a cute and fun party!!! Thanks for stopping by Brenda. I am now following back! This is so cute! My boys would love something like this when they are bit older. I love the looks on their faces. Pinned this. Thanks for linking up at Family Fun Friday. Thanks Marissa, I am heading on over right now! Awww, that's so super cute! 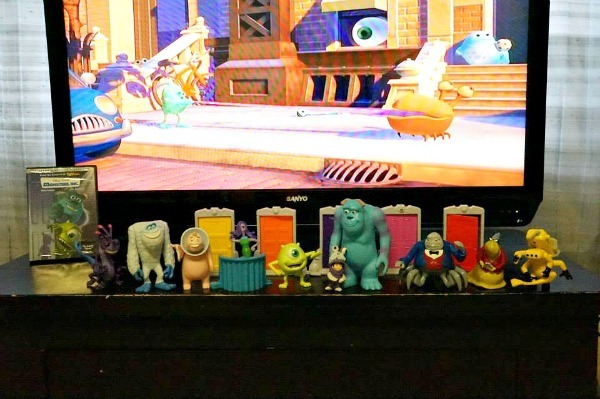 Especially with the Monsters University coming out in a few weeks. This is perfect for that! 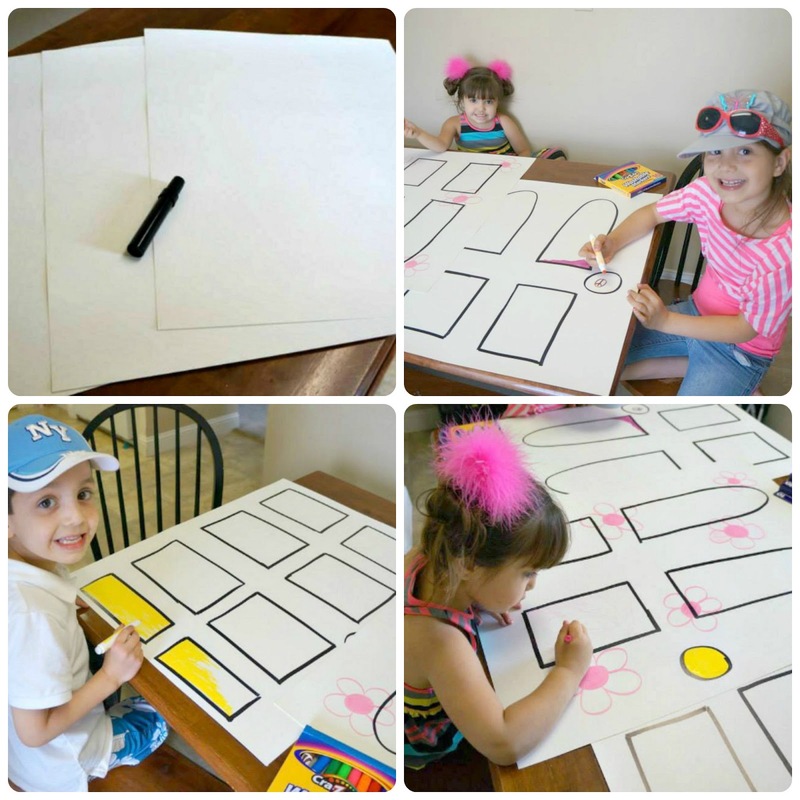 Thanks for sharing at Pinworthy Projects. LOVE this!! Thanks so much for linking it up on Let's Hear it for the Boy! This is so awesome! 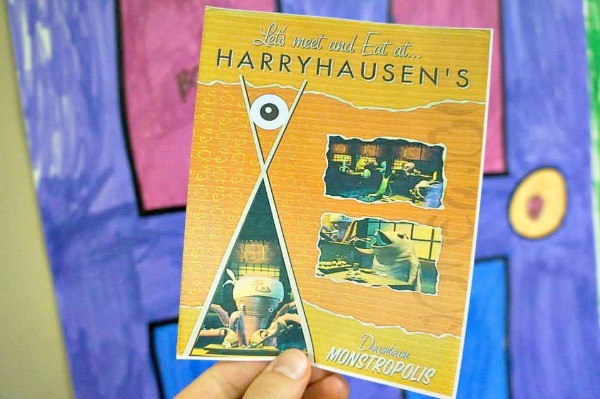 I just finished redecorating my son's bathroom with Monsters University. We will have to have a Monsters Inc. party before the new movie comes out! Oh I bet the bathroom is darling. How fun! Awesome! I'm planning to have my niece over for a Monsters Inc movie day, so I may try some of your ideas! Thanks for sharing! Sounds fun, glad you stopped by Chrissy!